Staying at a campsite in Perigord gives you the opportunity to learn about the region's 4 colours: noir/black, pourpre/purple, blanche/white and verte/green. Let's take a moment to explore Périgord Vert (Green Périgord): it stretches along the North of Dordogne, at the crossroads of the Charente and Limousin departments. Many rivers, like the Dronne, Isle, Auvézère or Bandiat meander through its green and wooded landscape. 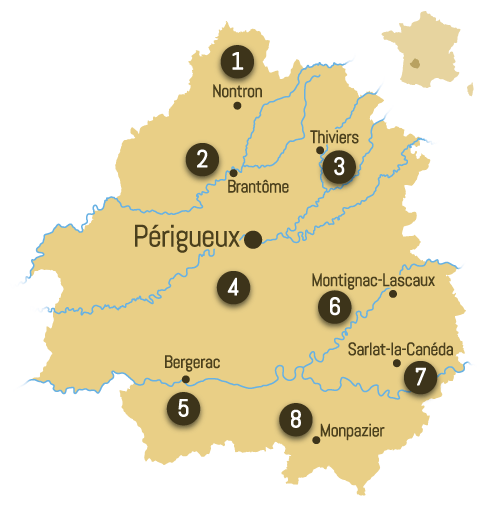 Divided between the Dordogne and Haute-Vienne departments, the Périgord – Limousin Nature Park was created in order to protect this natural heritage. It is now up to you to explore it, with the utmost respect fot the environment obviously, while at a campsite in Perigord. The diversity of its gently undulating hills are particularly suitable to strolls and bicycle riding. The park is also a land of tradition dotted with many villages of authentic charm. Among these, Saint-Jean-de-Côle is certainly one that deserves a visit, all the more since it is also classified as one of the "Most Beautiful Villages of France". Highlight is château de la Marthonie, whose 12th century towers overlook the village's main square. If you choose to go camping in Perigord, and more precisely in Perigord Vert and Perigord - Limousin Park, you'll see that many towns are also renowned for their local expertise. It is the case for the area's main city, Nontron, for instance. An ancient Celt oppidum, it later became a Gallo-Roman castrum, then a fortress during the Middle Ages - unfortunately, only some remparts remain. Nontron is still worth visiting though for it has becomes specialized in the ancient craft of making knives. These are now famous far beyond the borders of Dordogne. Apart from the knives, Nontron also puts on several exhibitions on handicrafts and other artistic careers. Pleasant campgrounds dot the Nature Park. You can stay at a campsite of Perigord in a caravan, tent, campervan, mobile home or cottage.